Painted steel frame ensures ease of cleaning and rust resistance. Manufactured with 1/4 inch flat iron. Our most economical choice for farrowing flooring. Heavy wire decks are woven for durability. 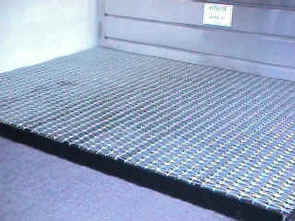 Plastisol coating on 9 gauge expanded metal produces a "strong but soft" long-lasting floor. Diamond-shaped hole openings measure 1/2" x 1"
For farrowing, nursery & finishing. Rectangle openings 13/32" x 1-1/2"
For small animals up to 100 lbs. 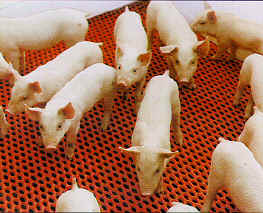 Tenderfoot / NS (nursery) is specifically designed for use in standard nurseries and will accommodate pigs up to 100 lbs.